Top > Study > Private informaiton > When you use the computer that isn't yours, what should you do? ■ When you use the computer that isn't yours, what should you do? There are many computer that use the Internet is possible everywhere. For example, there is it in an Internet cafe, a school, a company, a library and so on. And nowadays it is put in the private rooms of a hotel. It is very risky that went away you keep inputting your personal information when you use that computer. Because your personal information is known to people who use the computer after you. 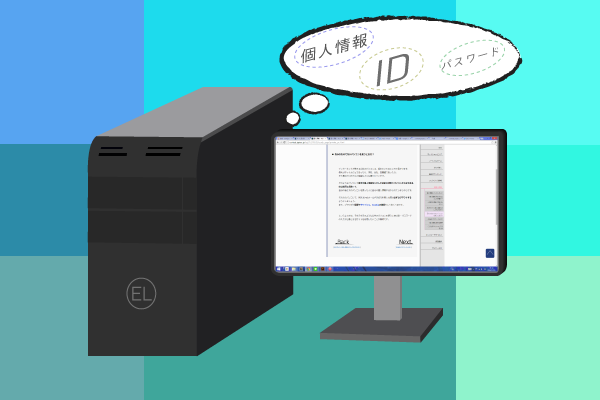 When you use web mail or SNS for these computers, you must log out. And you should delete a browser history, cache and Cookie. ▲When you put personal information on a public computer, you have to do with minute attention. Rather than that, from the beginning you shouldn't use the sites that needs to put ID and password. Therefore, in what I copy an item to use well and save, I come to be able to access a more quickly usually information. It is record that read web page and can in this way receive the service that I stopped last time from the interruption point. but am regenerated halfway when I saw the animation once again.